This ring is from the third batch of such rings we've had Bennie make for us since 2011. We've made these in the past with over-sized stones; this time we had the rings made with smaller stones more suitable to everyday wear. We literally sort through thousands of stones to pick the stones for these rings. We like to use thick stones with stunning color from a variety of mines. The beautifully sculpted border work is known as "saw and file" work; initially cut out with a jeweler's hand jigsaw and smoothed and further shaped with a jeweler's file. 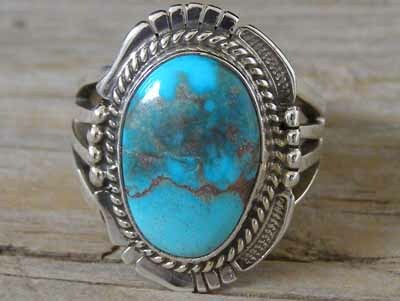 We had Bennie make the shanks from heavy 14 gauge Sterling so the shanks would be appropriately sturdy and worthy of the fine stones used in these rings. The shank is split into four narrower bands before attaching to the ring back. This makes for a supremely comfortable ring. Buffed to a high shine and impeccably handmade. Hallmarked "BENNIE RATION" under a set of eagle talons and stamped "Sterling" on the ring back. Ring face: 1" x 11/16"
Width of shank in back: 1/4"
Click here to see this Artist's entire collection!